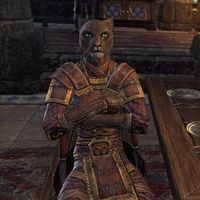 Ra'zaym Iron-Ear is a Khajjit member of the Fighters Guild and the Province General of Elsweyr. She can be encountered with the other Council‎ members at Vulkwasten, Sentinel or Fort Amol during the quest Proving the Deed. Ra'zaym can be found with the rest of the Fighter's Guild council, waiting for evidence linking to Jofnir's killer. "You look formidable, comrade. Perhaps one day you'd care to spar with Ra'zaym, yes?" Perhaps. Why are you so confident? "This one is the province general of Elsweyr! She has earned the name Iron-Ear, and fights like a champion of Thizzrini Arena. You'd do well to watch your tongue, my friend." After returning from Ragnthar with evidence implicating Sees-All-Colors as Jofnir's murderer. "Ra'zaym hopes you have returned with something to report." "Unbelievable. To think...Ra'zaym was recruited into the guild by Colors herself. To sit here, hear what has been said...."
This page was last modified on 30 July 2018, at 11:51.